My favorite part about summer is wearing sandals. I just can't get enough of having my toes out in he sun, feeling breezy, finally free from a winter of wooly socks. 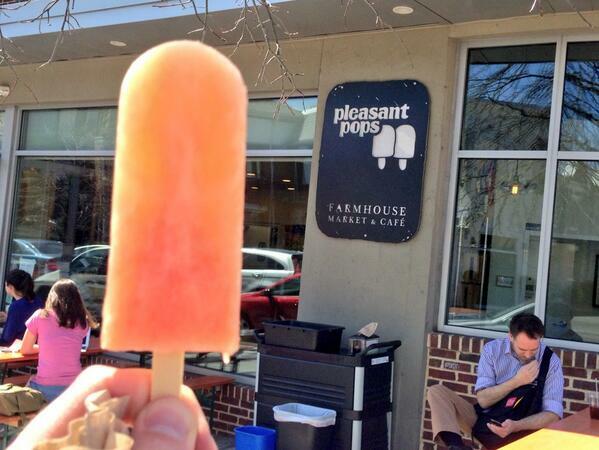 And sure, you can probably guess where this post is going, writing for a popsicle shop and all. And yes, you'd be right to think that these few paragraphs will mostly be about all things pops, giving you a glimpse into two delicious Pleasant Pops favorites. But, let's continue elsewhere, with another summertime necessity, namely cold-brewed ice coffee. Rather than being redundant, I’ll suggest you scroll back a few weeks and read about our truly tasty, utterly thirst quenching ice coffee and what makes it so good. Once you're caught up to speed, imagine us making a doubly strong batch of cold-brewed Mass Appeal coffee, stirring it into some Trickling Springs half and half, and throwing in some roasted chicory. Sound good? More like great. Welcome to our newest pop: New Orleans Ice Coffee. Both refreshing and energizing, the New Orleans Ice Coffee pop has become an instant success. Trailing after the Cafe Ole pop and the Vietnamese Ice Coffee pop, the NOLA pop is by far my favorite coffee pop thus far (though the first two will definitely reappear later this season!) Using half and half rather than whole milk helps provide a rich and creamy base for the sharp and bright coffee. Finally, adding the classic touch for New Orleans coffee, the smokiness of roasted chicory balances the pop perfectly. So when your Monday morning commute gets almost too hot to handle, try grabbing a New Orleans Ice Coffee pop for the chilly caffeine boost you're craving. I guarantee some extra pep in your step.